Gin and tonic, a key lime cake, and a little imagination. It all began when I had the idea to make the cake of all cakes: something unexpected, exciting . . . inebriating! "Life changing?" you ask. Maybe even that: I wanted to make a gin & tonic cake. A GIN AND TONIC CAKE! Are you excited? Should I repeat again in all caps? For such an outstanding idea, though, I was surprised that I couldn't find any recipes online that fit my criteria. All I wanted was a towering key lime cake (and classy, too...i.e. ditch the intense green food coloring), soaked in a syrup of gin, tonic and lime juice, with a similarly flavored light cream cheese frosting. Is that so much to ask for? Really, internet. I decided to step it up. 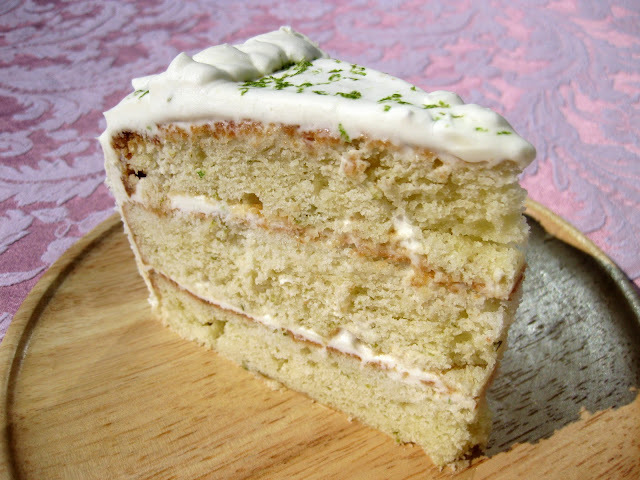 The top of each key lime cake layer is soaked in a gin syrup. To build my own dream gin cake I'd have to piece together each element on my own. This risky and time-consuming approach was an overall success, but I won't lie...all did not go as planned. Happily, it was tasty. Sadly, it didn't change my life...and somehow (also sadly?) I did think that a cocktail in cake form might change my life. One friend summed up the main problem in a nutshell: "I can taste the gin and tonic now that you tell me it's there." I don't want to have to obtain a liquor license to serve this cake, but I do want it to have a gin and tonic flavor that's loud and clear. What to do? More gin? More tonic? Add juniper berries to the batter? Only time and more tweaking will tell. There were other problems, too, explained below. For daring bakers and those readers who are just curious, I provide the recipes and what I thought about the outcome of each of the cake components. I'd still call it an overall success: it was a pretty awesome idea to bring to life, was much admired by those who consumed it, and made a tasty lime-flavored cake that did have a noticeable, if not totally obvious, gin and tonic flavor. 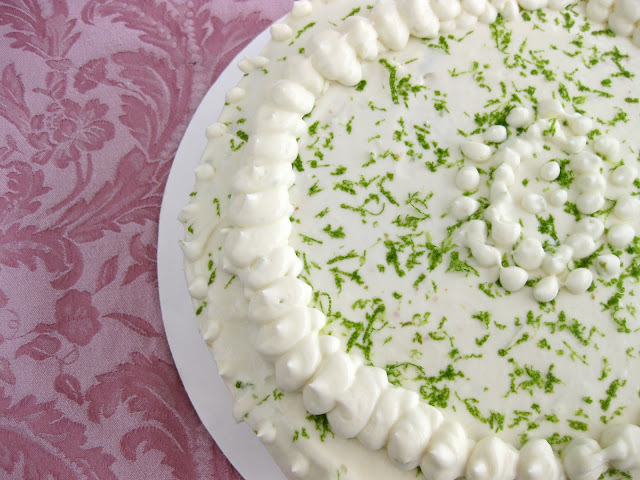 The gin and tonic cake frosting is cream cheese based, flavored with key lime zest. The frosting used cream cheese, whipped cream and gin and tonic syrup. Delicious, but not sturdy enough. 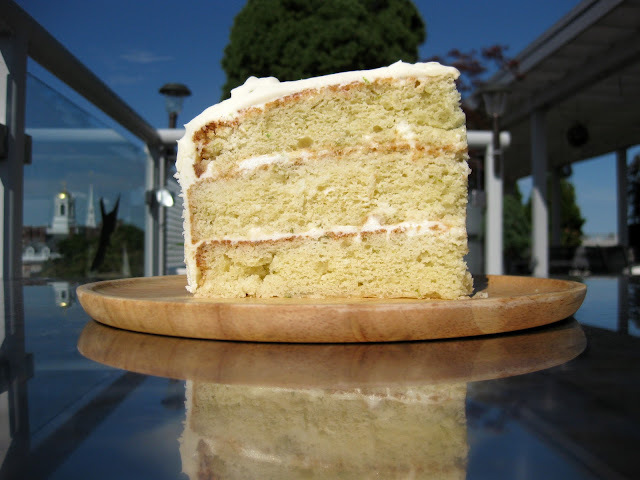 Gin and Tonic Cake layers: I was happy with it. The key lime cake recipe cooked faster than I expected (the original recipe suggested 25 minutes, but the layers cooked more quickly). As a result, it may have turned out a bit dry - nothing that a little bit of cocktail poured on top couldn't fix. Gin and tonic syrup: This turned out fine, but I want something stronger so that the flavor of the cake's namesake cocktail is unambiguous. Next time around, I would omit the water and instead dissolve the sugar in lime juice to make the simple syrup. I might even omit the sugar - there's plenty in the cake and frosting as it is. Gin Frosting: I took some liberties with the frosting, and all did not go well. I wanted a cream cheese-based frosting that wasn't as dense as real cream cheese frosting. Solution? Adding whipping cream sounded right to me. Then I also added gin and tonic syrup, because that seemed important. The result was just a little too runny. Next time, I'd try sour cream instead of whipping cream. The gin and tonic cake as a whole: It was okay, but still needs some tweaking. I'm providing the recipes below for my own record and for those who are curious. It's definitely worth trying to improve upon. 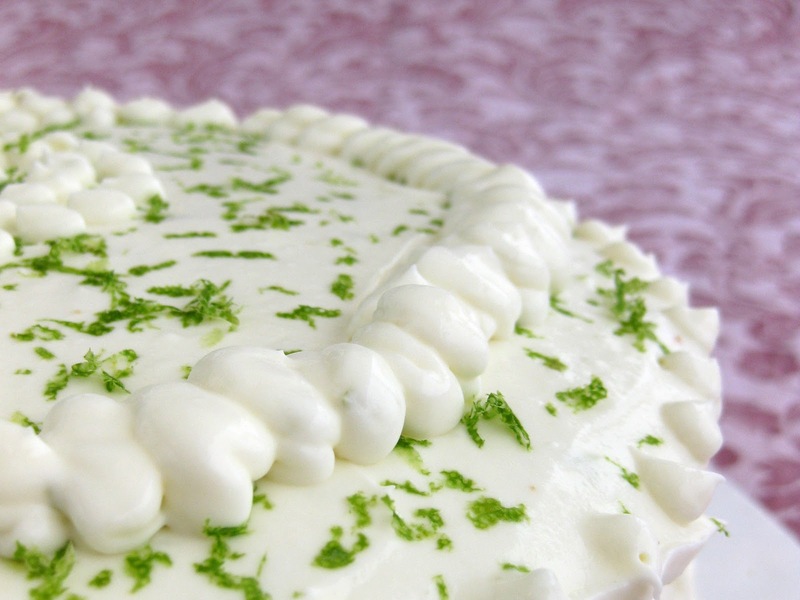 Future tweaking: Keep the key lime cake recipe, cut the water from the gin and tonic syrup, use sour cream instead of whipped cream in the frosting. If you try your hand at your own version of a gin and tonic cake, definitely drop me a line! I'd be curious to hear your approach and how it turned out. 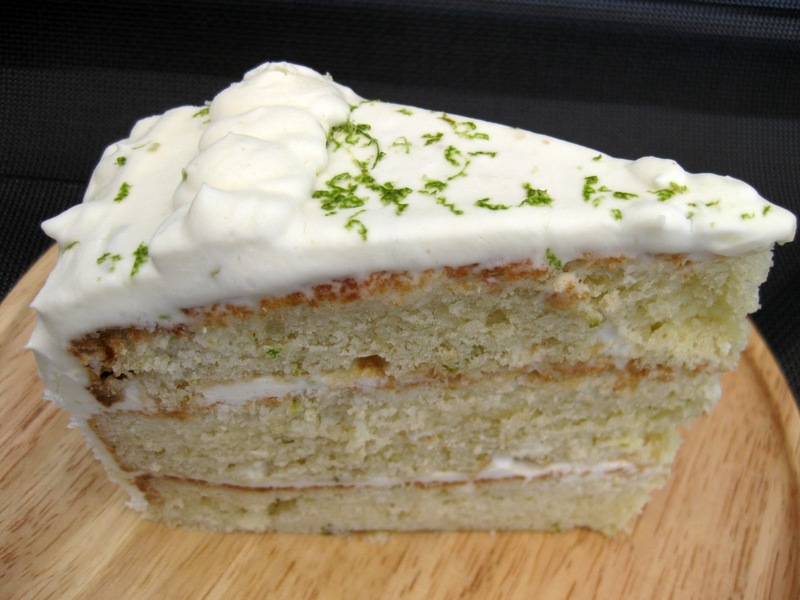 The key lime cake recipe was sturdy and flavorful. After surfing the interwebs for a while, I settled on an Epicurious recipe for a key lime cake recipe that had good reviews. It looked like the cake would be sturdy enough to handle being drenched in gin and tonic syrup while living up to my flavor expectations. I made several changes to their key lime cake recipe: I doubled the recipe, incorporated all of the lime zest into the batter, omitted the lime glaze, and replaced the self-rising flour with a combination of regular flour, baking powder and salt. Preheat oven to 350°F. Butter and flour three 8-inch round baking pan, and place buttered parchment paper rounds in the bottom of each pan. Using electric mixer, cream butter and powdered sugar in large bowl. Beat in eggs one at a time. Beat in milk, lime juice, and zest (set aside 3 Tbsp zest for frosting), then beat in flour. Batter will be very thick. Pour batter into the cake pans and level the batter. Bake until toothpick inserted into center comes out clean. For me, this was about 15-20 minutes. To get that authentic gin & tonic flavor, I felt that I needed to make a huge gin & tonic and incorporate it into both the cake and the frosting. I looked to those who had gone before me in this territory, and deferred to a recipe for gin & tonic syrup used to soak a white chocolate sheet cake. Dissolve the sugar in the water in a small saucepan over medium heat. Simmer for 2-3 minutes. Remove from heat and allow to cool. Combine the cooled syrup with the gin, tonic water and lime juice. I soaked each layer of the cake liberally with the syrup as I assembled the cake, added a 1/4 cup to the frosting, and still had some syrup left over. In a stand mixer with the paddle attachment, beat cream cheese and butter until fully combined. Add sugar, zest, gin and tonic syrup and whipping cream, and switch out paddle attachment for the whisk attachment. Beat on high until the frosting holds peaks. As mentioned above, this frosting is not so sturdy; I had to chill it to help it thicken up a bit. I then frosted the cake and set it in the freezer for an hour or so until it was time for dessert, just to be sure that frosting wouldn't ooze out. In the future, I'd remove the heavy whipping cream and instead add 2 cups of sour cream. I'm guessing I'd need to double the frosting recipe to cover the cake since I would lose a lot of volume by omitting the whipping cream. I'm not sure when I'll try version two of the gin and tonic cake recipe, but I will be sure to share when I do! Again, let me know if you've ever tried something similar or have any ideas! I had a go at making this recipe with your suggested tweaks... It was... interesting. Thanks for trying some of the tweaks I was thinking of! This is one experimental recipe I'd love to keep pursuing, in hopes of finally getting an awesome gin and tonic cake. I'll keep your experiences in mind on my next go-around with it! I'll check in with you when I do, since it looks like we're on a shared quest for a common end. I haven't tried it, but it has some different ideas from yours. Thanks! I haven't seen them yet...can't wait to give these a spin!